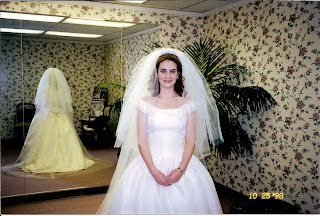 I have a great wedding dress story. Seriously, you must read this entire post. It's good people. 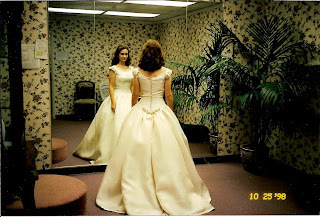 From the moment we got engaged, I dreamed of picking out my dress. I looked at every Bride magazine published. I realized after starting to try them on that it made no sense to pick a dress out of a magazine because every dress that I had picked out in a magazine looked horrible on me. My future dress was in a magazine and I passed right by it, never knowing how important that page in the magazine would become to me. 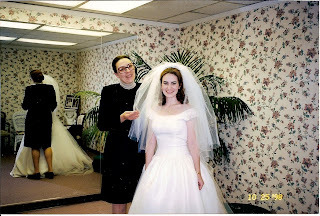 I had done a bit of dress shopping with Randi when she came to visit me in Virginia but we didn't find the one. I found one that I liked a lot but then when my mom came and I showed it to her she was like "it's o.k." Needless to say, it wasn't the reaction I was looking for. My mom and I decided to go to a bridal boutique called Hannelore's . It's in old town Alexandria, Virginia and is very well known in the area for having designer gowns (you know Vera Wang, Badgley Mischka, and people like that). I had to make an appointment several weeks in advance. When we arrived, I was assigned to a consultant named Christelle. She was an older, German woman who had a very matter of fact personality. I told her the kind of gown I wanted and she started pulling. She told me they were having a trunk show of gowns by Amsale that weekend. Not only that, but Amsale was in the store showing off her gowns and helping brides one on one. I didn't know much about Amsale's work back then. I have since fallen in love with her designs. She designed this number for the Season 2 finale of Grey's Anatomy. Whenever I watch a red carpet event and I hear someone say "Amsale" when the who are you wearing question is asked, I squeal with delight. Christelle brought me several dresses and I think I only tried on a couple before I got to "the one". I knew it the second I put it on. I knew it the second I saw my mom's face. It was my dress. It was simple and elegant with a full skirt and not a very long train. It made me feel beautiful. 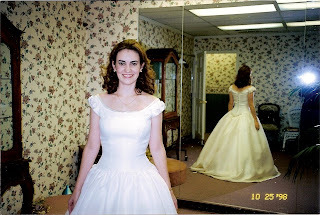 Once I found the dress I wanted, Amsale came in my dressing room to look at me in the dress. She walked around me in a circle looking at the dress. She said it was beautiful on me but that she thought something was missing. She then said, "what if we do this to yours? ", taking a piece of silk ribbon and adding it around the waist of the dress and flowing down the back. It made a HUGE difference. I told her I thought it was a great idea. 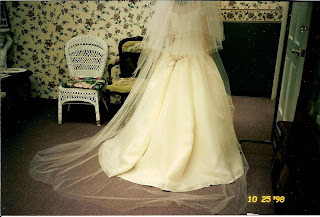 I ordered the dress in white (the pictures below show the dress in ivory because that was the sample they had) along with the extra special touches that Amsale did. My mom and I were so giddy about finding my dress that we completely forgot to take pictures. I was so disappointed. I called Christelle later that day and asked if we could come in the next day to take photos. She said sure so that is what we did. We went back the next morning and were looking around at headpieces, shoes and such while we waited for Christelle to get my dress. While perusing a table, I heard a voice behind me. It was a voice I thought I knew but I thought to myself, no way, it can't be HER! My mom was a few feet away from me and I called her over. I said don't look right now but is Sandra Bullock standing behind me? It was, in fact, HER. She is one of my favorite actresses and I just about lost it. She was there with her sister and parents (her sister was getting married soon). My mom and I freaked out, not right there of course, we waited until we were in the dressing room. We asked Christelle just to be sure and she said "yes, that is her" and told us about her sister. My mom wanted me to ask her for a picture but I just didn't feel it would be right because she was there with her sister, trying to be normal. It was enough just to see her. I was then happy that we had forgot to take pictures the day before and were back. I put my dress back on and got pictures!!! Here they are for your viewing pleasure (this is not the veil I got, it's just for show). These buttons are real and it took my mom and bridesmaids about 30 minutes to button them on the wedding day. And this is one of my most cherished wedding memorabilia items. 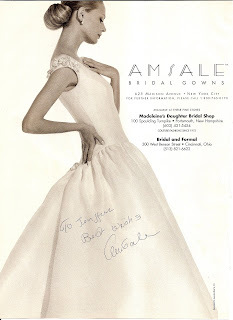 It is the page out of the Modern Bride magazine that has my dress on it, signed by Amsale. This is the catalog I already had and the page I flipped right past, not even noticing the dress that was to be mine. How awesome! The dress is beautiful! 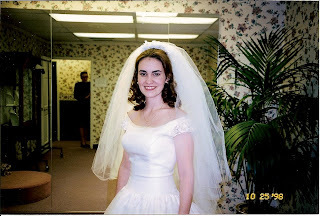 I have an anniversary (2) coming up next week. I was thinking about doing posts like this, but for me, everything was so casual (..ahem....unorganized) and undocumented...it would only be good for one post! That was such a special time to share with you. What very fond memories!! Thanks for letting me be a part of that very special year of planning. 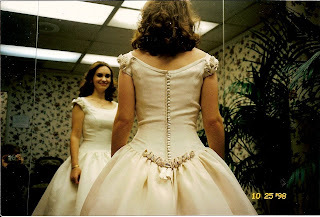 A gorgeous dress and a wonderful story. Getting ready for a wedding is definitely a busy time. It's nice to look back and think about those planning days. What a beautiful dress, Jenn! I was blessed to get to wear my mother's dress. When I tried it on, it fit me like it was made for ME. I was so excited. Also, on Sandra Bullock. She lives not far from my hometown (in Austin--at least she used to). Anyway, my brother was at a dance a few years ago and saw her across the dance floor. He walked up to her, asked her to dance, and she said "YES!" So he has an amazing experience of a fun night of dancing with a real, life star. Another of my friends spent a whole day skiing with Julia Roberts (flirting the whole time--really it's a cool story) and yet he had NO idea who she was the whole day until the end of the day when she took her mask off and stunned his whole group of friends that he was meeting back up with. Definately THE dress for you.....you looked amazing! I also sqeal for you every time I hear someone mention Amsale on the red carpet! Wow! That is the most AMAZING wedding dress story I have ever heard. 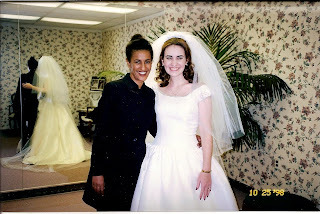 And you know that I am a wedding planner/bride's assistant, so I've heard TONS of wedding dress stories over the years! That IS a gorgeous dress, but I wouldn't have noticed that ad either. The dress looks way better on you than on the model. How often does that happen? OOOHHHH! i LOVE that dress! Beautiful!